Hanoi (VNA) – The Vietnam Red Cross Society (VRC) on August 9 launched a text-message programme to raise funds for people in flood-hit areas in northern Vietnam. By texting “UH” to the number 1409, a donor can donate 20,000 VND to the programme, which lasts from August 9 to October 7. 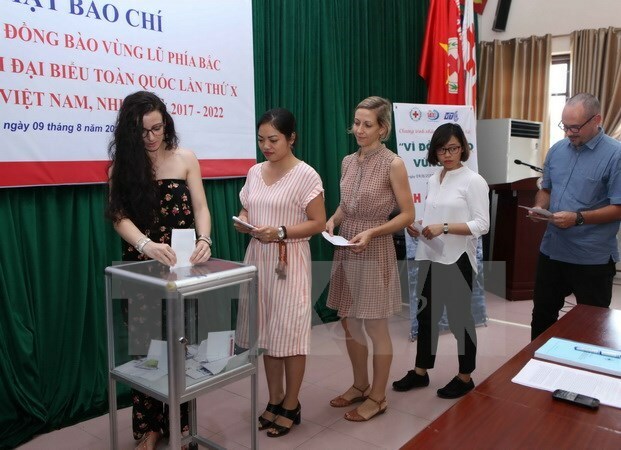 Other material aid can be delivered to the VRC headquarters at No 82 Nguyen Du street in Hanoi or its southern representative office at No 201 Nguyen Thi Minh Khai street in District 1, Ho Chi Minh City. Money can also be sent to the bank account “Trung uong Hoi Chu thap do Viet Nam”, number 124 02 02 005 348 (for VND), 124 02 02 018198 (for USD), or 124 02 02 006862 (for EUR), at the Hoang Mai branch of the Vietnam Bank for Agriculture and Rural Development (No 127 Lo Duc street in Hai Ba Trung district, Hanoi). All of the collected money and materials will be used to support flood-affected people with fundamental goods, housing and livelihoods. On August 8, the VRC also called on its chapters, members and people nationwide to provide assistance for flood victims. The campaign will last until the end of September. Heavy rains and subsequent flash floods occurred across northern mountainous provinces over the last few days, especially in Yen Bai, Son La and Lai Chau provinces. The intense floods had also eroded over 25,000 cubic metres of national highways, 117,706 cubic metres of provincial and district roads; damaged 145 irrigation works and 2,072 metres of river dike, causing about over 940 billion VND (41.36 million USD) in economic losses in the region.